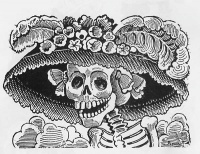 José Guadalupe Posada (2 February 1852 – 20 January 1913) was a Mexican engraver and illustrator. He was born in the city of Aguascalientes, where he learned the art of lithography and, by 1871, was working for a local newspaper called El Jicote ("The Hornet") but after 11 issues it closed and he was forced to flee. After a few years, he eventually joined the staff of the Mexico City publishing firm of Antonio Vanegas Arroyo, creating various book covers and illustrations. Much of his work was also published in sensationalistic broadsides depicting various current events. Posada's best known works are his calaveras, which often assume various costumes, such as the Calavera de la Catrina, the "Calavera of the Female Dandy", which was meant to satirize the life of the upper classes during the reign of Porfirio Díaz. Most of his imagery was meant to make a religious or satirical point. Since his death, however, his images have become associated with the Mexican holiday Día de los Muertos, the "Day of the Dead". They draw on Native American motifs. Largely forgotten by the end of his life, Posada's engravings were brought to a wider audience in the 1920s by the French artist Jean Charlot, who encountered them while visiting Diego Rivera. While Posada died in poverty, his images are well known today as examples of folk art. The muralist José Clemente Orozco knew Posada when he was young, and credited Posada's work as an influence on his own. Unless indicated otherwise, the text in this article is either based on Wikipedia article "José Guadalupe Posada" or another language Wikipedia page thereof used under the terms of the GNU Free Documentation License; or on original research by Jahsonic and friends. See Art and Popular Culture's copyright notice. This page was last modified 13:36, 7 August 2008.